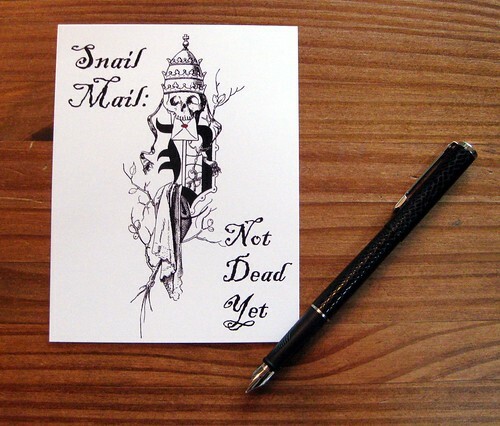 The Missive Maven: Snail Mail: Not Dead Yet! I'm really excited about these two new updates to my etsy shop. 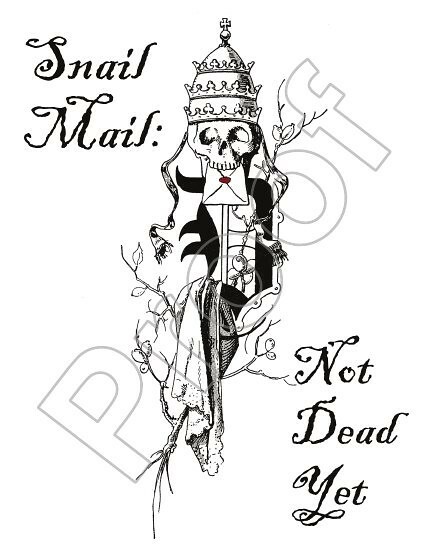 First we have the creepy, skully, "Snail Mail: Not Dead Yet" design. 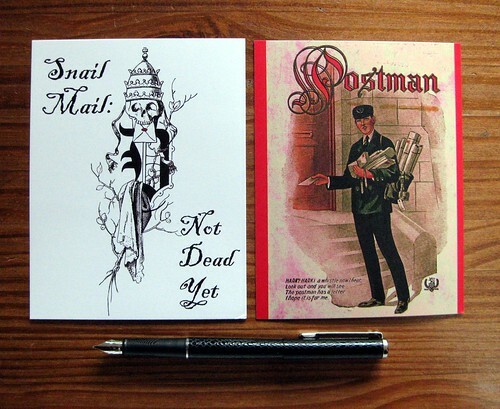 Don't you hate it when someone says "snail mail is dead" or "no one writes letters anymore" or something like that? I do! I put those sentiments to work in my slightly creepy, goth-inspired, Monty-Python-quoting design. ...so I took a picture to prove it! This is a close zoom with two different inks (Noodler's Eternal Hunter Green and Legal Lapis, for those who are curious). 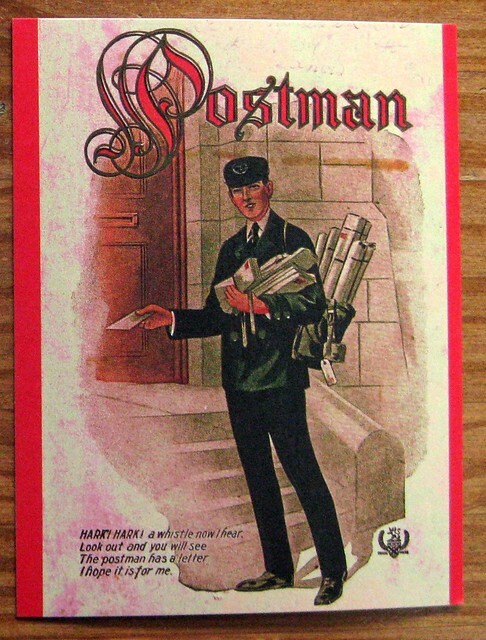 I also have a reprint of my Vintage postman illustration design. The original set from moo.com is almost sold out, and aside from being not terribly friendly to fountain pen ink (a bummer, in my book), they are also quite expensive. They cost lots more for me to print, so they cost more for you to buy. I decided to try out a different printer for this run, and I'm really happy with the results, as well as the fountain-pen friendliness. I chose a recycled, matte paper for this postcard. If you're indecisive like I am, or you like variety, I'm also selling them in combination packs: 5 postcards, you choose how many of each design. 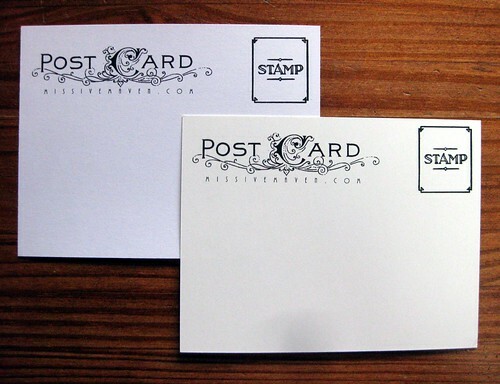 Here you see the backs of the postcards, with the matte Postman on the bottom and the glossy skull on the top. The matte color isn't quite as bright white. 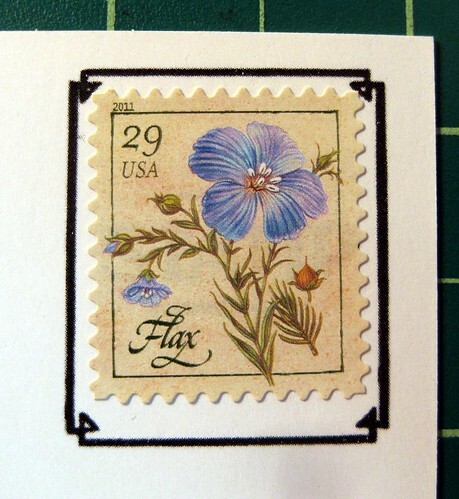 The frame on the back is a perfect fit for the current design of 29-cent postcard rate stamps, the correct postage rate if you're sending domestically within the USA. I'm really excited about these postcards! I'm sure I'll be using them for a lot of my own correspondence, too. I'd really, really love your input, though: my blog readers give me the most valuable feedback, and I cherish it. What do you think? Would you buy? Why or why not? 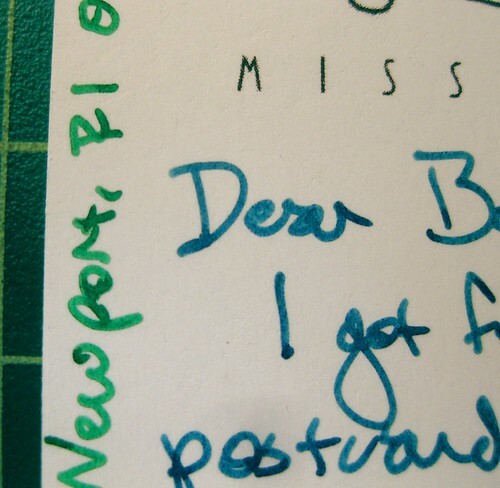 Who did the design on your SnailMail is not dead card? I really like that - heck yeah I'll buy when will they be in your shop?? Julie, sorry if that wasn't clear - I designed them both! And they're in the shop now. I was actually looking at these last night on Etsy and thinking "hmm, she's not really clear in the description that this is her own design -- maybe it's not?". But now reading this blog post -- damn, woman. You have TALENT! So: I love it, and would buy some if I wasn't in financial lockdown (am trying to go through stuff I already have on hand before spending any more money on new stationery). And yes, it makes me want to slap people when they say "no one writes letters any more".... with the current Canada Post strike, there have been quite a few vitriolic opinion pieces in various Canadian papers -- one guy compared the post office to having an appendix: might as well cut it out because it's useless. Bah! And to clarify further - I designed them based on the vintage graphic which I got (legally!) at The Graphics Fairy. I altered the graphic and added and placed the text, so I gather in the design world that this means I designed it. I did NOT draw or create the skull graphic, though I did add the red for the envelope sealing wax and change the edges of the graphic somewhat. But thanks for the compliments, Carrie, and I am so sorry about your postal strike! Perhaps even worse is the appendix comparison. Blah. Suggestion for the next postcard: "Email... When you care enough to send the very least." Oh that "Not Dead Yet" design is fantastic! Also, wholeheartedly agree with @Joseph, your next one should definitely be some sort of sly dig at the e-mail-is-just-as-thoughtful crowd. I'll be purchasing a pack of these postcards post haste. Chandra, wow - what a compliment! Thanks! Ashley, thanks for your compliments (and order!) - and I love the feedback. Next design will definitely involve some email dig. I very much agree with the snail mail not dead yet design, I alway's get irrate when people look at me like I am some sort of science project when I say I pen pal and go "Oh? I didn't think anybody wrote letters anymore."